When you see a sign telling you to “Beware of...” something, it’s followed by something pretty simple like “Dog”, “Hitchhikers”, or “Mutant Sewer Sharks” and you know you should keep your distance, otherwise it wouldn’t be saying you should beware of that thing. The sign would say “Hey Come Check This Out, You’ll Love It!”. That doesn’t seem to be the case with all signs though, and sometimes mixed messages get sent. Too bad you can’t just ask the sign what it wants from you. 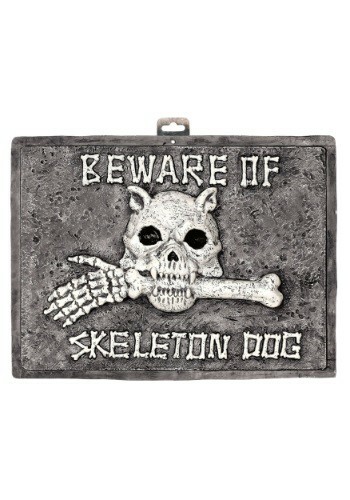 Luckily, this Beware of Skeleton Dog Sign doesn’t mince words. It very directly informs you that you should beware of the dog, and if you were wondering which dog, it says “Skeleton Dog” for clarification. If you still aren’t sure what this dog in question looks like, it has the likeness of a dog skull right smack in the middle. If you’re wondering why you should be wary of it, the bony human arm in the dog’s mouth clears that right up. If you need to warn people about your skeleton pooch, or you just want to scare everyone off of your lawn, this sign will get your message across!